Keynote provide a variety of visual effects for use as transitions between slides and at the beginning of slides. You can choose which transition you like best and set it up in the Transition pane of the Slide Inspector. Automatic Transitions are basically transitions but you don't have to push the space bar to operate it. You set a limit of time of how long you want your slide to be. It has how long before or after on each slide. 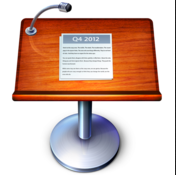 Show all your presentations with Keynote! There are a LOT of builds you can have for your presentation on keynote! Such as cube, fly in/fly out, lens flare, shimmer, sparkle, and much more. You can use them for putting in your pictures or text. They have some in 3D and 2D motion!